Cristal Ballpoint Pen features a clear barrel so you can see the available ink supply and a roll-proof, hexagon-shaped barrel for comfortable controlled writing. Design includes a ventilated cap and brass bold point with tungsten carbide ball. Cap color matches ink color. Ballpoint pen delivers long-lasting dependability and smooth writing, and writes with consistent, sharp, effortless lines. 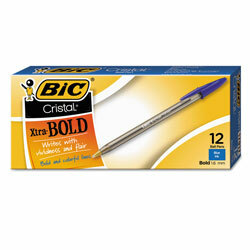 Blue Ballpoint Stick Pens from Bic! 1873 In Stock today. A friend told me about these pens, she loves them. I gave them a try but I'm not sold. Thick pen tip, which I like, but fuzz and excess ink ball up on the end of the tip and you have to wipe it off regularly so as not to smear it on your papers. Grip is comfortable, but my writing with it appears sloppy. I like the medium point Pentel RSVP much better.